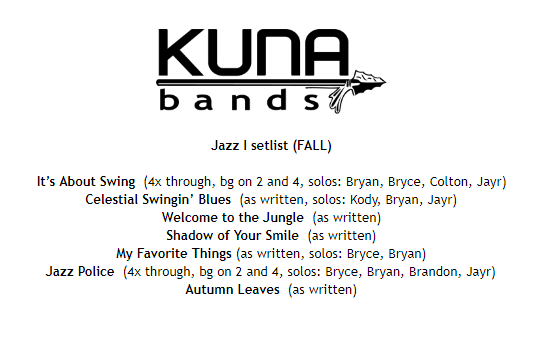 Kuna Jazz I is the premier jazz ensemble in the Band Program and features the finest instrumental jazz musicians at Kuna High School. This outstanding ensemble performs contemporary and standard works for jazz band. Students in Kuna Jazz I work to develop their skills for a higher level of performance and artistry while also preparing for scholarship auditions and college-level playing. Each year Kuna Jazz I performs at several local and out-of-area events. These events include various local concerts, community events, the District III Jazz Festival, BSU Gene Harris Jazz Festival, and Clinics. Jazz I frequently travels as part of a spring performance tour at concert exchanges and out-of-area jazz festivals. Membership in Jazz I is open to students by audition only. Participation in marching band and a concert ensemble is a requirement for membership.